The recipe is from Nobu’s second cookbook, Nobu Now, but is more French or Italian than Japanese. All you really need are good, fresh scallops and their shells, soy sauce, garlic, butter, lemon, and parmesan. Nobu uses parsley but I swapped it for some tiny morsels of bacon. Clean your scallops, disconnecting them from their shells and then after patting dry, placing them back on again. Add a tiny amount of butter on the scallop, a drop of soy, a little grated garlic, and (for me) a few of the bacon morsels (already cooked). Sprinkle the scallops with freshly grated parmesan and pop them into a preheated oven and cook at 200 Degrees C for 4-5 minutes. Please note that if using a convection oven to place your scallops on the highest rack, so that the cheese is nearest the hot metal conductors. Serve the finished scallops with a wedge of lemon and leave it to your guests to add the juice if they want to. We served this as a starter to a simple 4-course Father’s Day lunch and it went over really well. My only regret is that I only bought enough for one scallop per person. I could have easily eaten a plate full of them. This is beautiful. I have a major crush on scallops. I just can't get enough. Thanks for the new idea! That looks incredible… and easy! 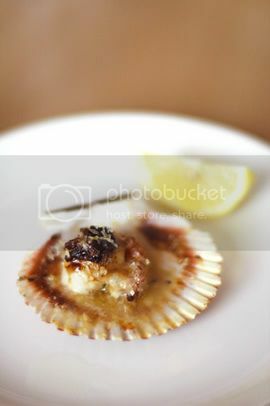 Once in awhile I'll find in-shell scallops at the market and next time I do, I'm making this. I love the parsley substitute for "tiny morsels of bacon"! Brilliant! you have finally blogged about a dish easy enough for me to try making.which basically tells you what a cooking novice i still am.Thanks for this recipe! Will definitely try it out in Melbourne in the months to come.